Available in SHORT OR LONG SLEEVE!!! 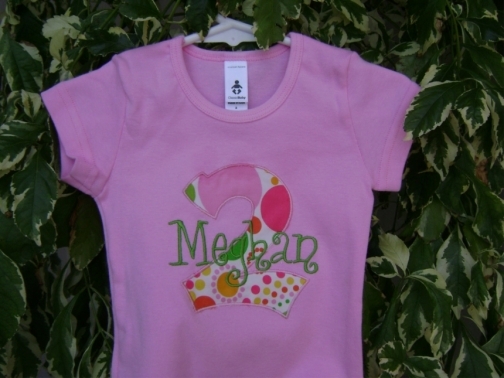 This cute little t-shirt features how old your child is turning in one of these cute fabrics. 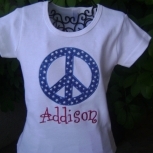 It will then be personalized with your child's name in your choice of fonts. I have hundreds of different fabrics available. T-shirt colors available: White, Pink, Black, Navy, Red, Baby blue, Light pink available in sizes 3-6M through toddler size 6 (not available in youth sizes, Brown available in infant and girls cap sleeve but not boy crew neck. 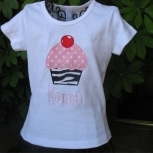 (The 3-6M through 18-24M are in the lap-t style neckline the larger sizes are in the regular crew neckline). THESE SHIRTS DO SEEM TO RUN A LITTLE BIT SMALL SO I ADVISE ORDERING THE NEXT SIZE UP, IF YOU WOULD LIKE TO SEE A SIZE CHART JUST EMAIL ME AND I CAN FORWARD IT TO YOU. I only use high quality shirts from American Apparel. So cute and so comfortable for your little one. Item ships from: Santa Ana, CA, US. $2.00 USD ($0.75 USD when combined with another item) by USPS. I LOVE the product- beautiful work- as well as I can not believe how fast I received it for a custom made product- I plan on ordering alot more!!! !